The story so far. I was ill and slept through almost all of California whilst Ian got happy, manic, paranoid and sad on vast amounts of thick black coffee! I kind of came out of my slumber around the Nevada, Arizona state line to find Ian having a little chat to himself about friendship rings and Twinkies. 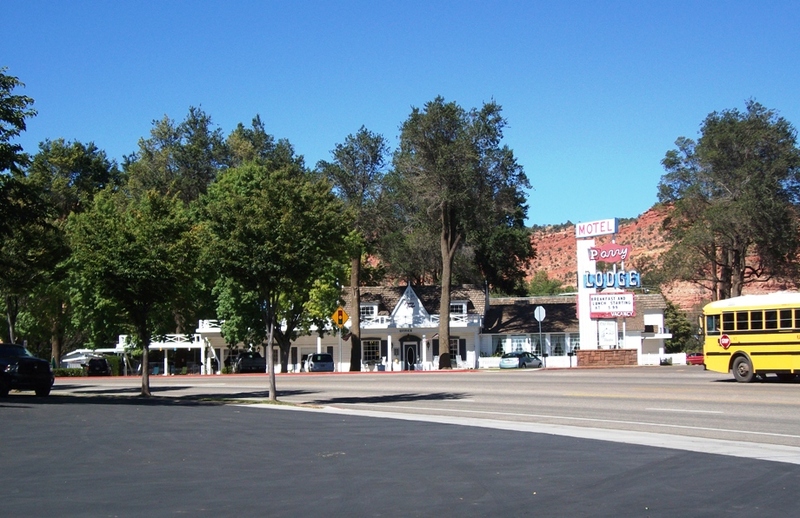 Around 60 miles east of Hurricane is the town of Kanab just north of the Arizona border. 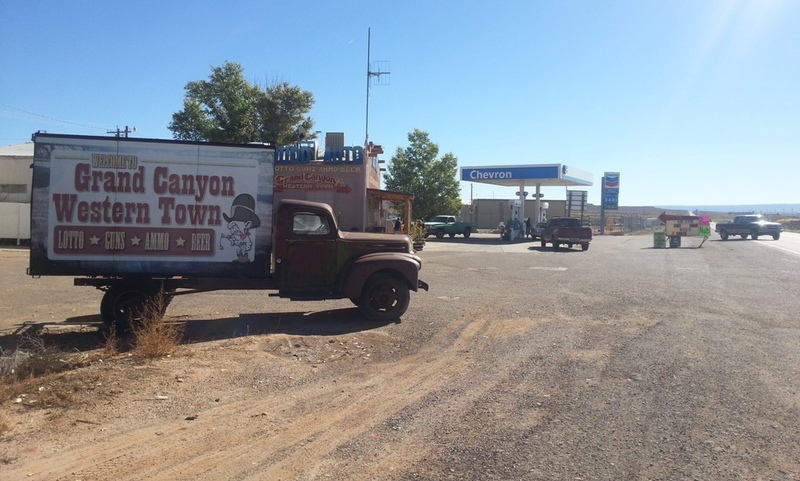 We arrived at a crossroads around 6 miles south of Kanab in the town of Fredonia Arizona and I noticed a sign on the opposite side of the road. We parked up and firstly met Gill who woke up Bill. 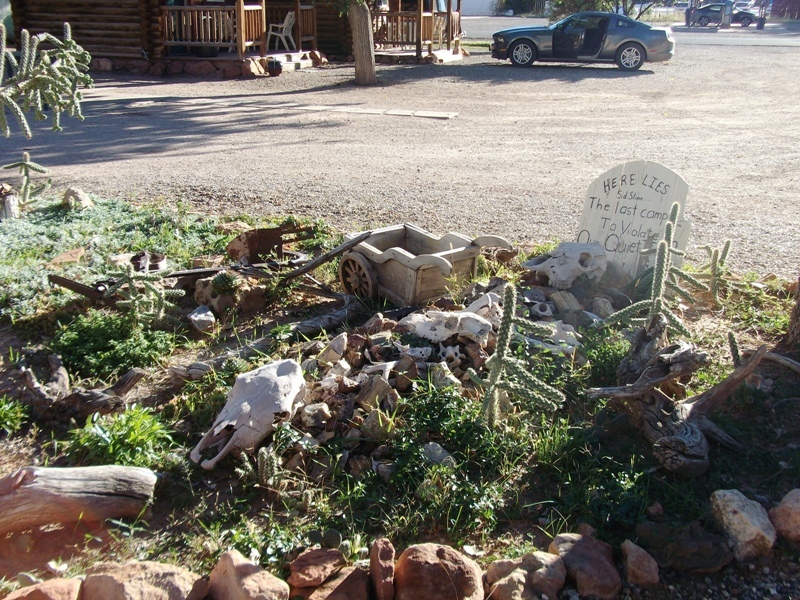 Bill wasn’t particularly happy, but reassured us not to worry “The place is clean an’ all, always clean, so clean” There was a lot of unruly growth around, not just on Bill but out of the ground to the point that we were unable to see any sign of a cabin. 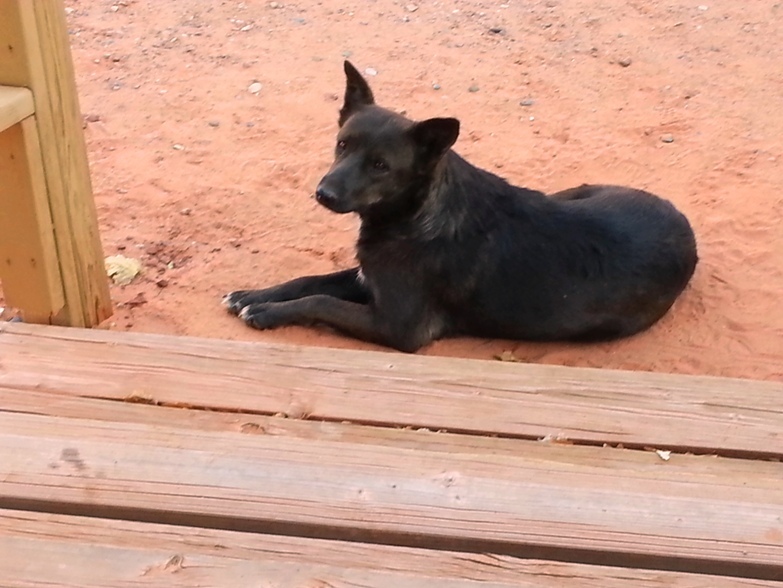 I noticed Ian had gone very quiet and was staring at the ground, I caught his gaze and we watched as a group of flies carried off a couple of dead cockroaches into the wilderness. Maybe they had been told to come back at 4pm too. It was midday and we were back in the car. 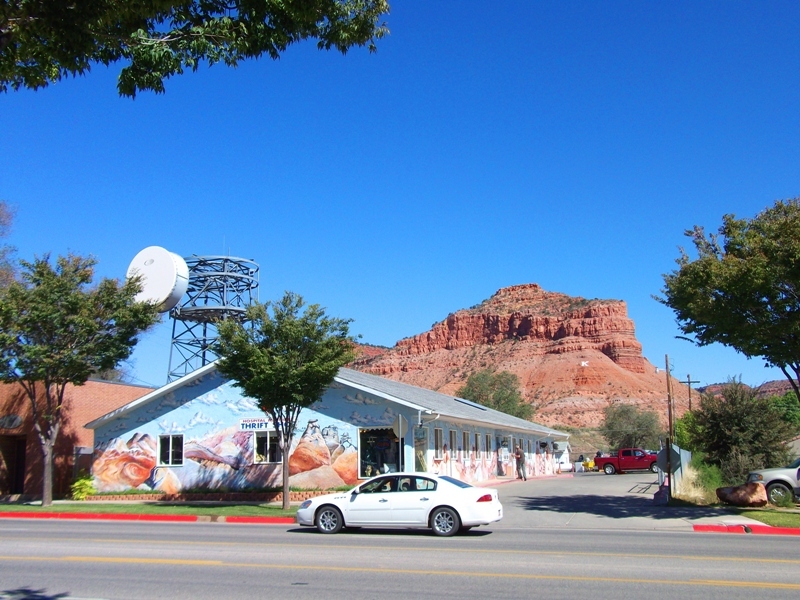 We headed north on the 89a and reached the Utah state line within minutes. 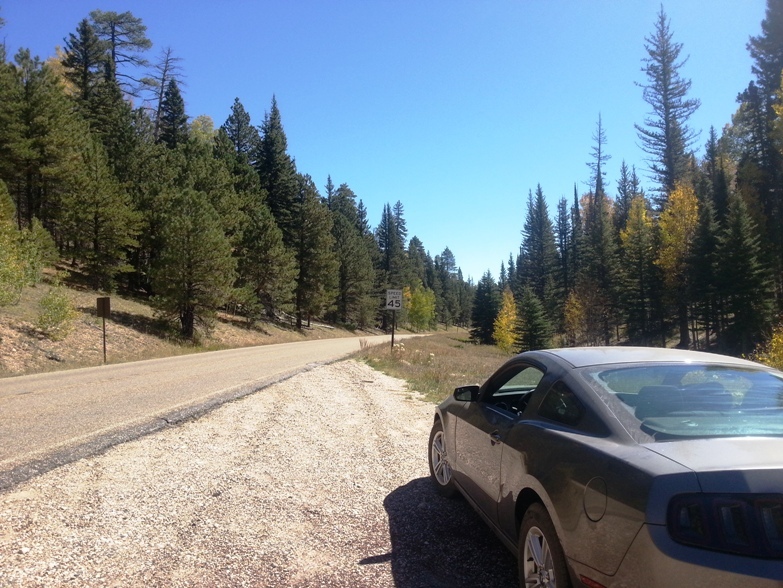 A different time zone, and a road like an airport landing strip. It was so quiet and so hot. 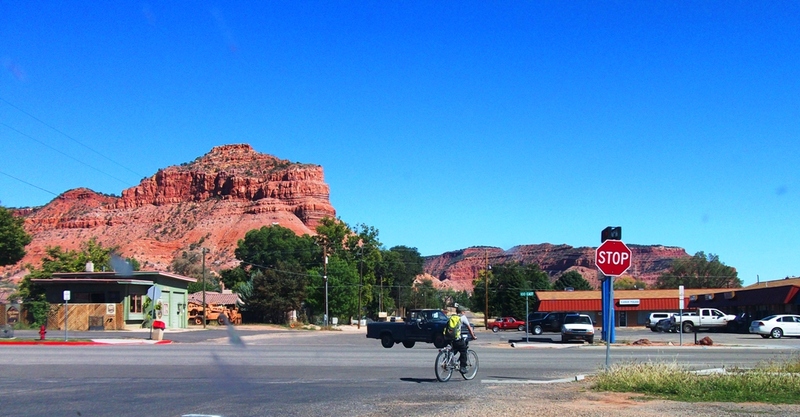 A couple of minutes later and we were in Kanab, officially a city but with a population of just 4500 people. 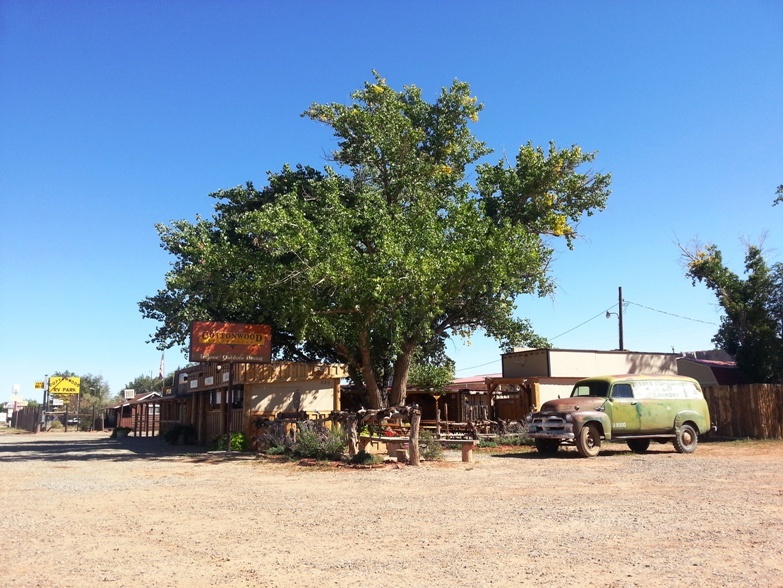 This place was a strange oasis in the middle of a vast dry desert. Noticeably, greener and cleaner. I immediately sensed some serious farming went on here, ladies baked, children played and there was an abundance of churches. Whilst we were there we saw ladies in what I believed to be traditional Mormon dress. 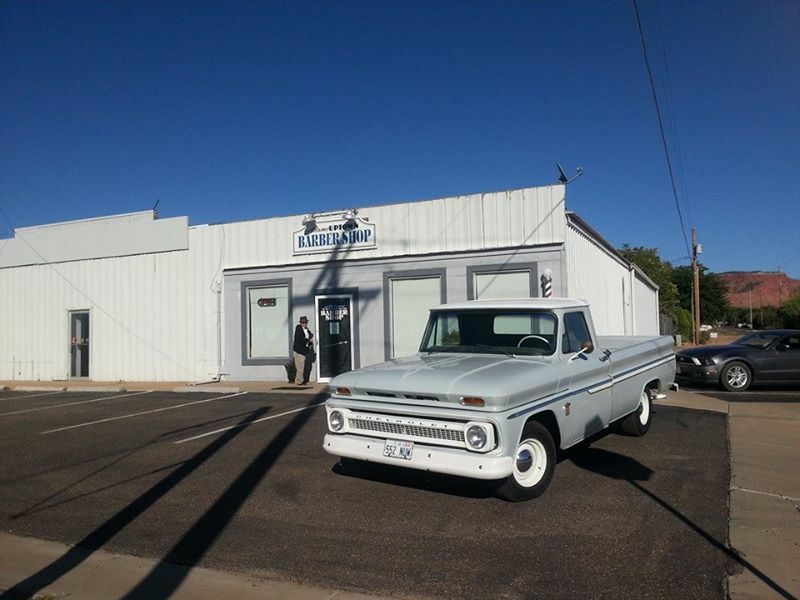 If it hadn’t been for the fine array of modern farm machinery and vehicles, you could have squinted looked left and imagined that crossing the state line out of Arizona had taken you back over 100 years. Looking left of course to avoid the likes of Mcdonalds, and chain motels. Mcdonald’s did however draw us in like flies to a cockroach and whilst eating our triple cheeseburger and fries we realised we were surrounded by English accents. 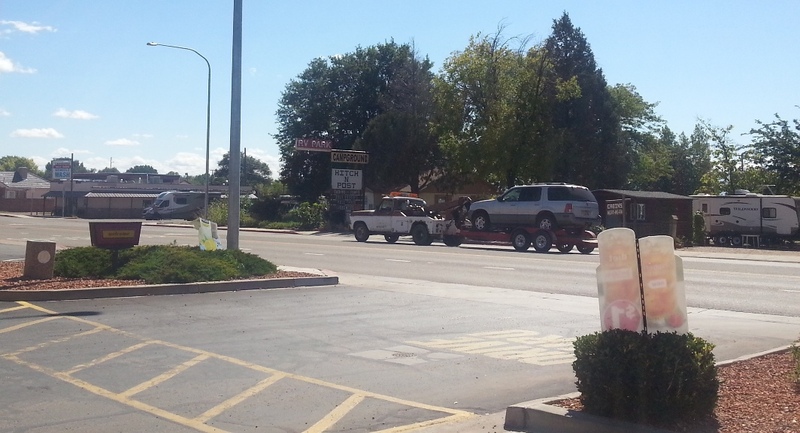 You kind of think when you take a roadtrip across the USA that your journey is going to be unique, but right now we were in a strange little town in the middle of nowhere with a group of people who had also been heading up to Bonneville and were in a traveling limbo. Some hyped up to bursting point for possibly months at the thought of experiencing an opportunity of a lifetime on the Salt Flats. They had all had a travel plan and now we were gathered here collectively, sorrowfully grabbing a hold of what we understood and trusted in the form of a Big Mac and a shake. 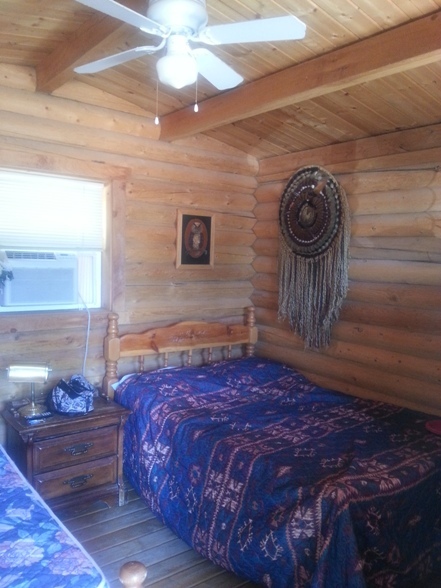 This place was super clean and each cabin had a small verandah, quaint with a huge bed and handmade quilted throw. There was a tiny television but no bathroom or kitchen. For the three nights we were there we watched repeated episodes of the bionic woman and acquired a special toilet that would have started it’s life as something else. 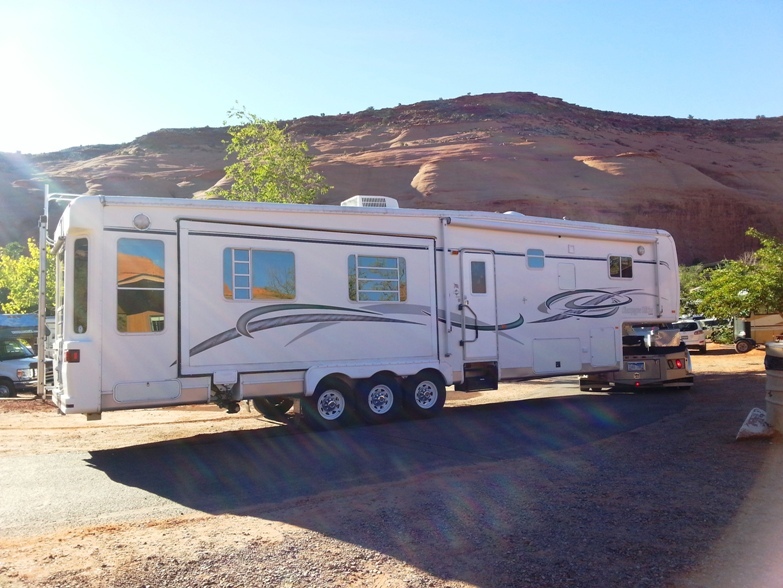 We discovered that Kanab is a centre point for tourists visiting Bryce Canyon, Zion National Park and the Northern Rim of the Grand Canyon, which apparently is around 220 miles (5 hours) by road from the Southern Rim of the Grand Canyon ! The people in the cabin next to us were a really friendly couple from Israel. Each cabin had a fire pit for cooking and they invited us to a bbq on the first night, we insisted on contributing and headed out on a search for meat and beer. Honey’s marketplace is like no other I have seen, it lures you in with quaintness, seduces you with the smell of home cook food, amazes you with their use of technology in certain sections, then in my case confuses you completely by not being able to find any alcohol. Ian was wandering up the breakfast cereal isle taking in the vast spectrum of colour. We bought some lovely steaks, ribs etc but kind of out of respect didn’t question the alcohol situation. We discovered Utah isn’t a dry state. I did get very confused with a variety of explanations as to what the rules actually are concluding with the possibility that nobody really knows, or maybe they do but they’re not going to tell you. I think, long story short, you can drink a limited amount of alcohol at a very low percentage if you are in a restaurant having a meal and this allowance only applies between certain hours of the day. There are government run liquor stores, don’t really understand what goes on there. 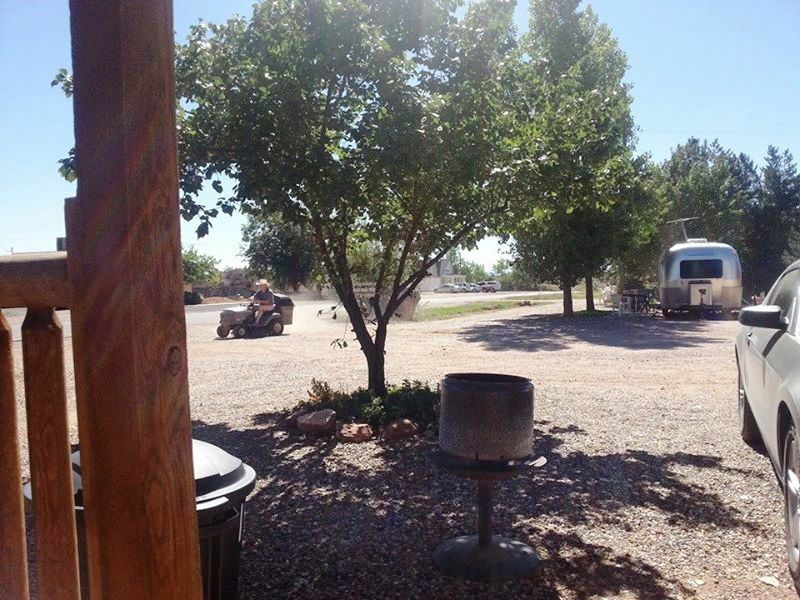 If all else fails get back on the 89 runway into Fredonia, Arizona, around 6 miles, speak to the nice tattooed lady and she may sell you a 3 litre bottle of California Red for just $5 ! You can’t miss the store it’s sign reads in large letters….. There could be a long queue of people from across the border. The day we were there a machine by the till was firing out lotto tickets like the receipt machine in the supermarket after you have done your 6 months worth of shopping before Christmas. None of the items of alcohol were priced which did concern me. The decision I am almost sure is in the hands of the nice tattooed lady at point of sale and I imagine there are many determining factors. I have never felt so English and so uncool in all of my life. A gap that seemed like forever. She smiled, possibly knowing that she had intimidated me, and proceeded to put my wine in a brown paper bag to sneak back into the neighbouring state. Well we felt like villains buying plastic cups so we could sit on the verandah of our cabin in a drunken disguise. 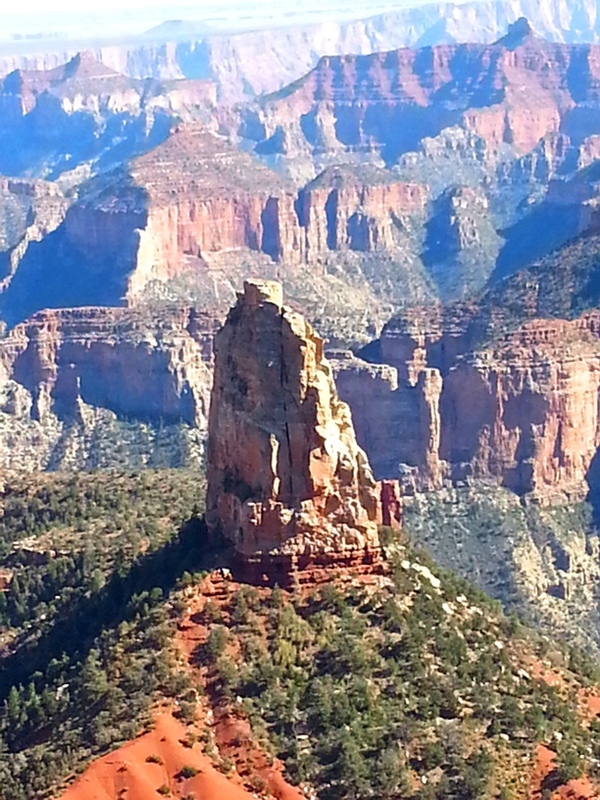 How on earth do you write about the Grand Canyon ? Something that has never been written before. Write something else other than what you can find out via the internet at the push of a button. 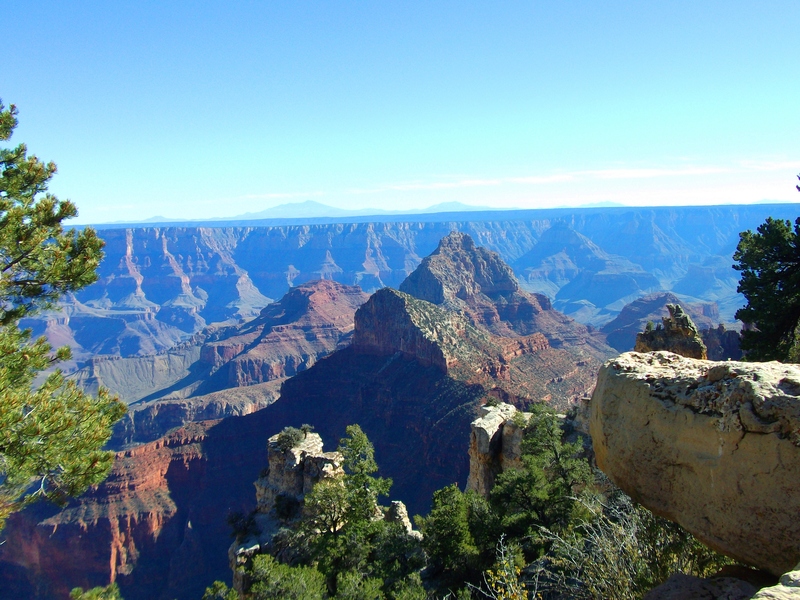 The Grand Canyon lodge and visitor centre on the Northern Rim are only open from May to October. Snow and bad weather conditions can often make the roads inaccessible. 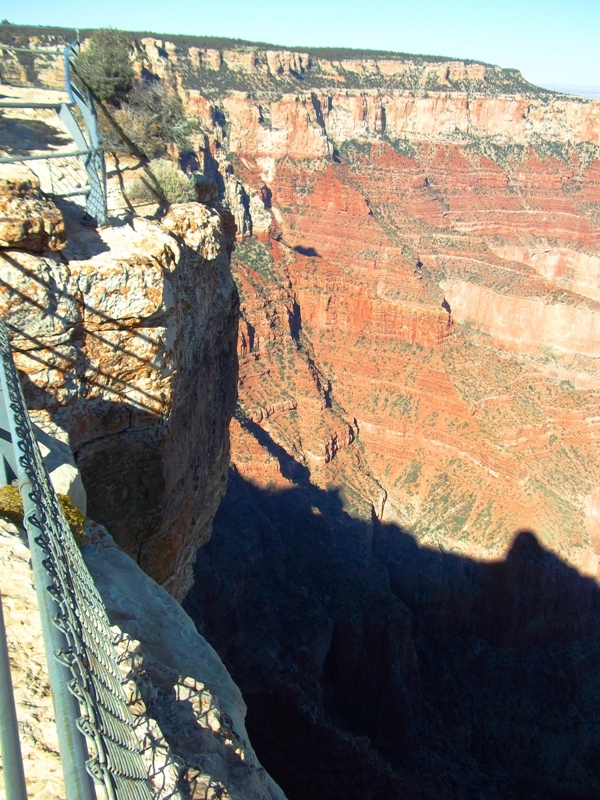 It’s visited by only 10% of Grand Canyon visitors. 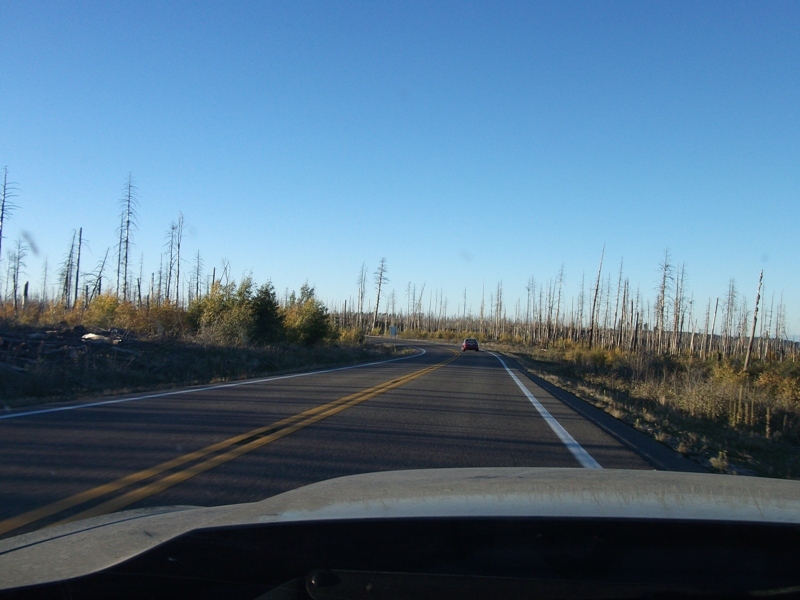 Driving down through the stunning Kaibab National Forest we couldn’t ignore that large sections had been devastated by wild forest fires apparently started by lightning from spring and summer thunderstorms. It was extremely sad to see and almost apocalyptic. 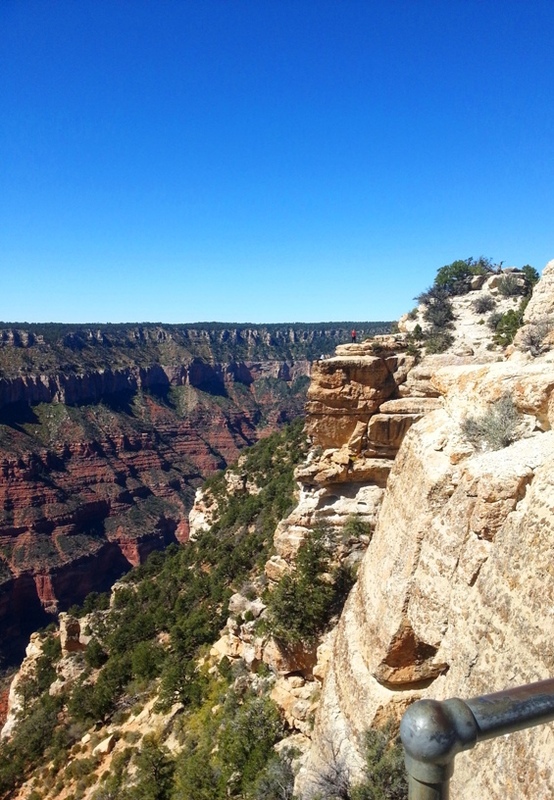 It wasn’t obvious we were so close to the Canyon edge when we drove into the visitors car park. 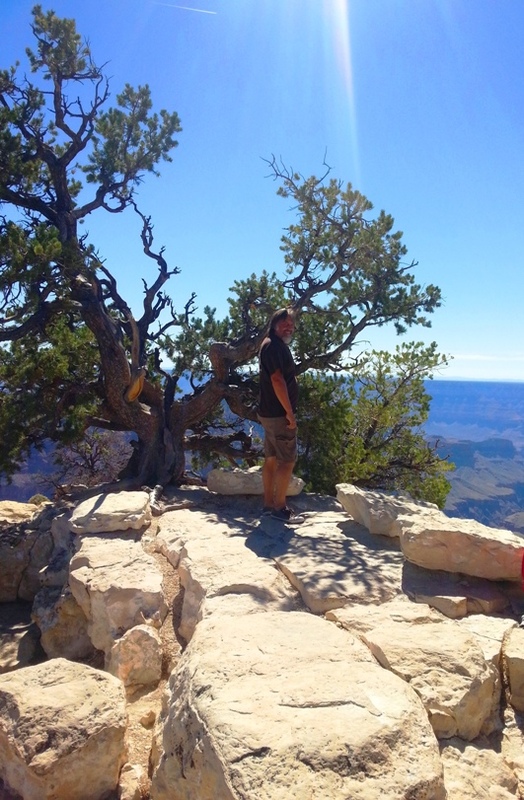 We were amongst large fir trees with the Grand Canyon Lodge to the Southern end. 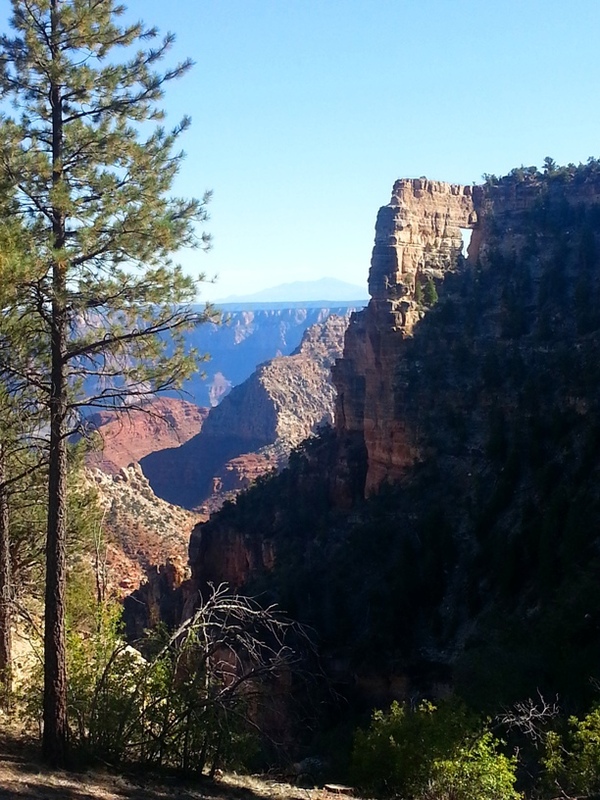 I heard a helicopter, loud but not visible above us, as my gaze dropped lower the helicopter disappeared low into the canyon and the place fell silent. We followed a trickle of people through the lodge and onto the Patio. 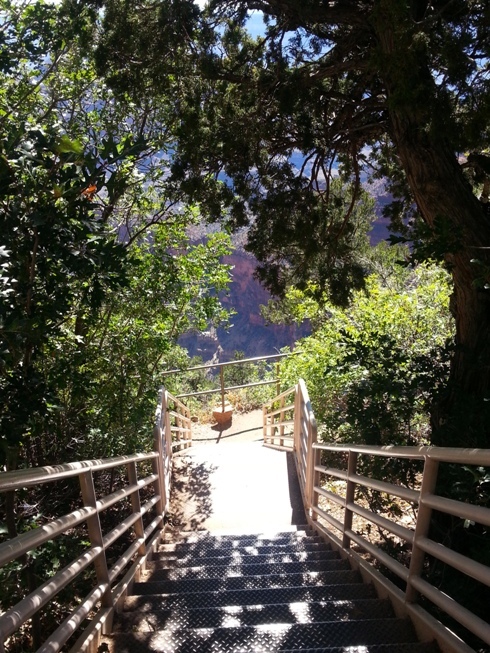 Nothing, as far as I am concerned can ever prepare you for the sensory overload as your eye’s try to adjust and focus to make sense of the vastness of space, length, width , and depth of the Canyon. The surreal spectrum of colour running through the layers of rock that change with light, season and shadow. A kind of sunken mountain range carved out by the Colorado river. 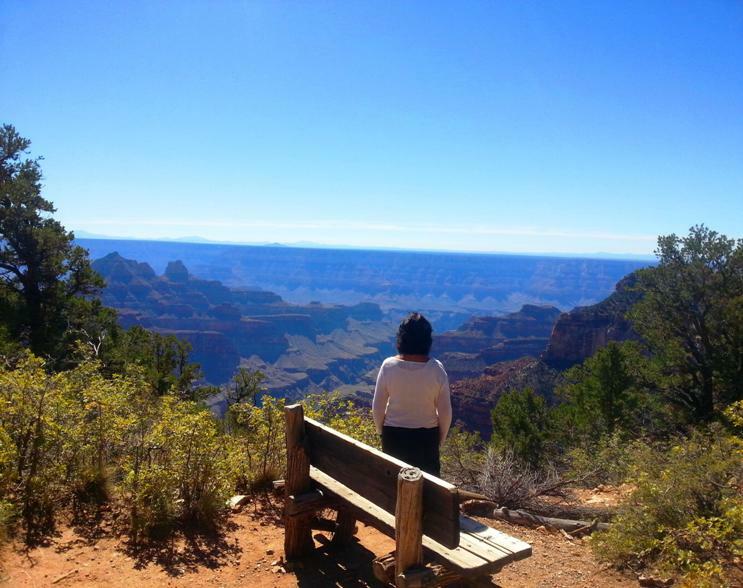 That day it was so quiet, people sat on purpose built wooden rockers whispering, mesmerized by the views. I was overcome with a strange mixture of feelings. 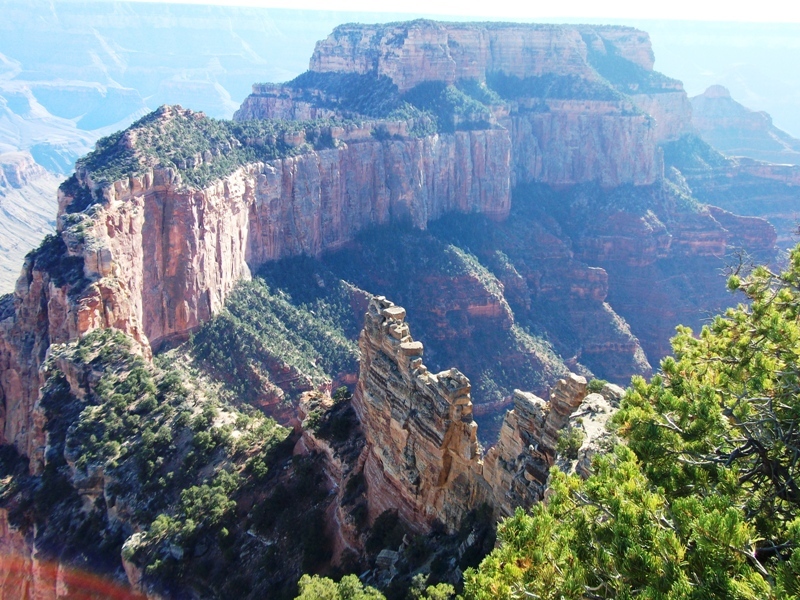 We were heading along the spine of a ridge to Bright Angel point, a view point. 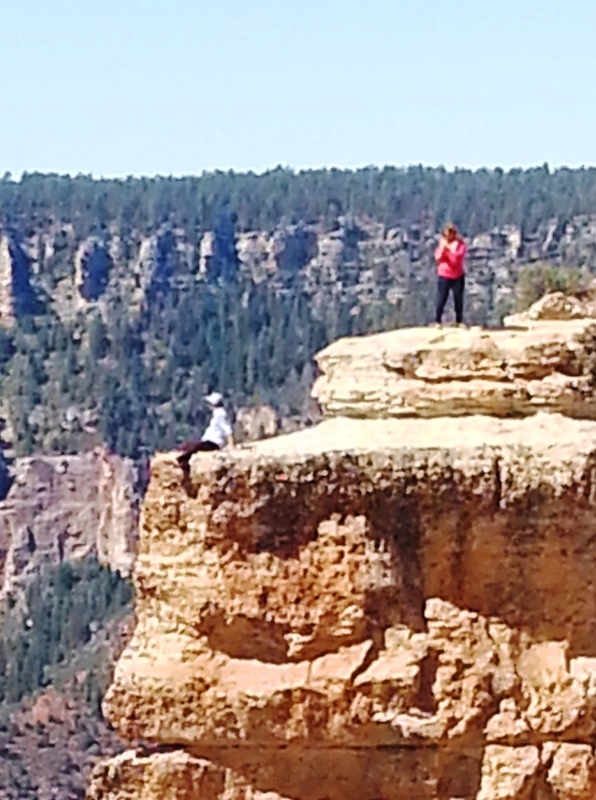 Teenagers were leaving the pathway where possible and sitting high on ledges their legs swinging out over the canyon floor a mile and a half below them. I didn’t make it to Angel point, I sat clutching a rock the size of a football hoping it would save me from the wanna be super hero lurking inside. Next stop meant getting back in the car and taking a scenic drive to Point Imperial the highest point on the Rim, this time I was ready, brave, I took the walk to take in the view but an older lady named Dorian from Tennessee had clocked that view about the same time as me, we screamed and clung to each other like kittens in a sand storm. “Hi I’m Dorian from Tennessee” We took a few steps back and adjusted ourselves to fit around the safety of a large rock. I wasn’t sure how to answer. It seems like the first day of school we were given a pencil and some milk, we learnt that Janet and John were leaders of the Modern World, Moses did some pretty amazing stuff and there was this place in America, a huge hole and it was awesome. Ian was chatting to her husband on a pinnacle almost two miles high, they were pointing and making all the appropriate sounds. At that point me and Dorian became forever friends, arms and legs entwined sprawled over that rock like a wet spider. 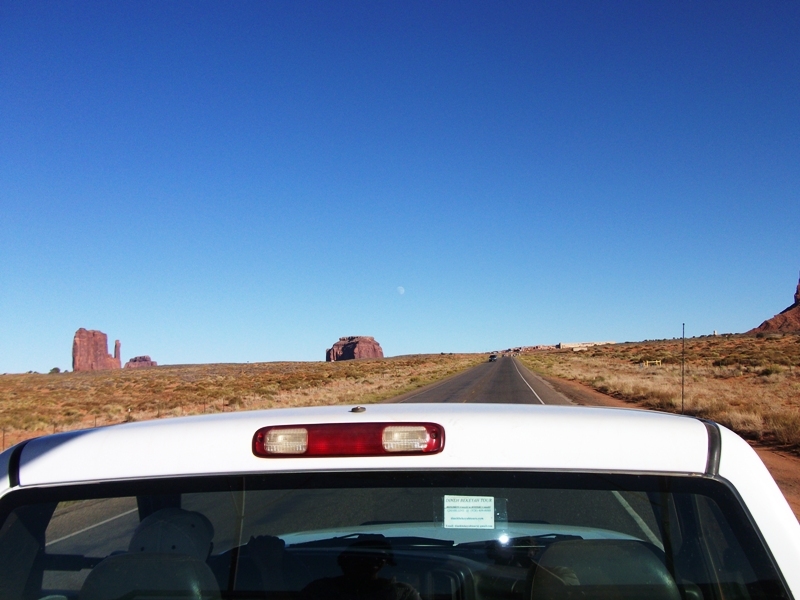 We got up early on our last morning to set off on our 200 mile journey to Monument Valley, with a possible stopover. 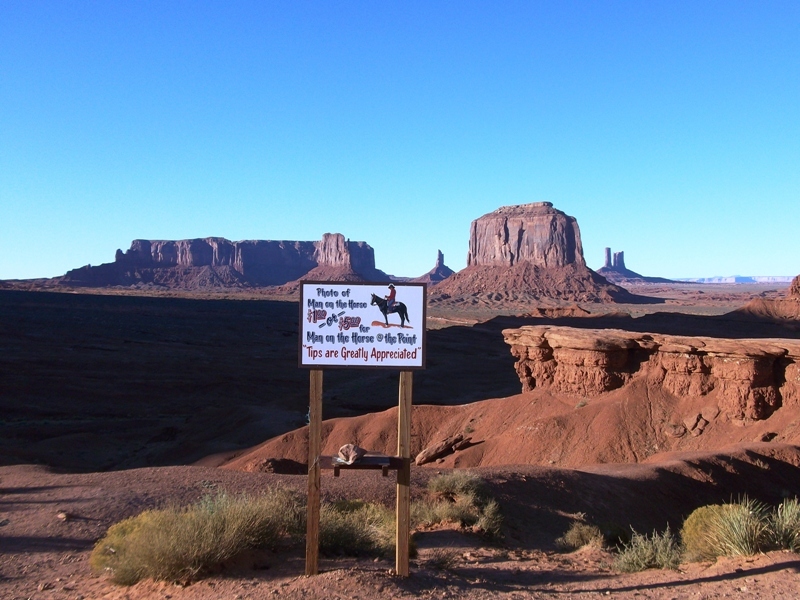 I had researched Monument Valley to some extent, not the kind of thing I normally do but the place has always fascinated me and about 10 years ago a new neighbour asked if he could accompany me on my morning walk with the dog. 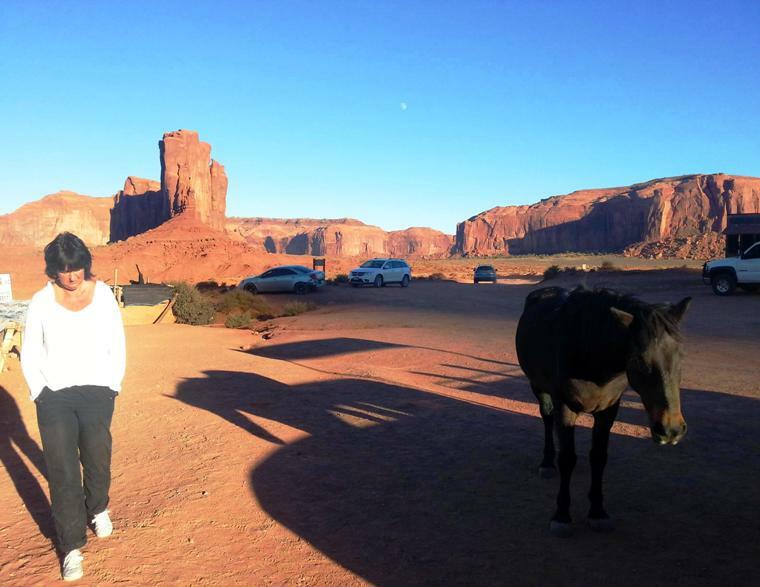 “Ok thanks, as far as I know my ancestors are from Wigan or Ireland” The guy didn’t stay our neighbour for too long and I didn’t really take much notice of what he said but it still made me just the tiniest bit curious as to what a Navajo looks and moves like up close ! 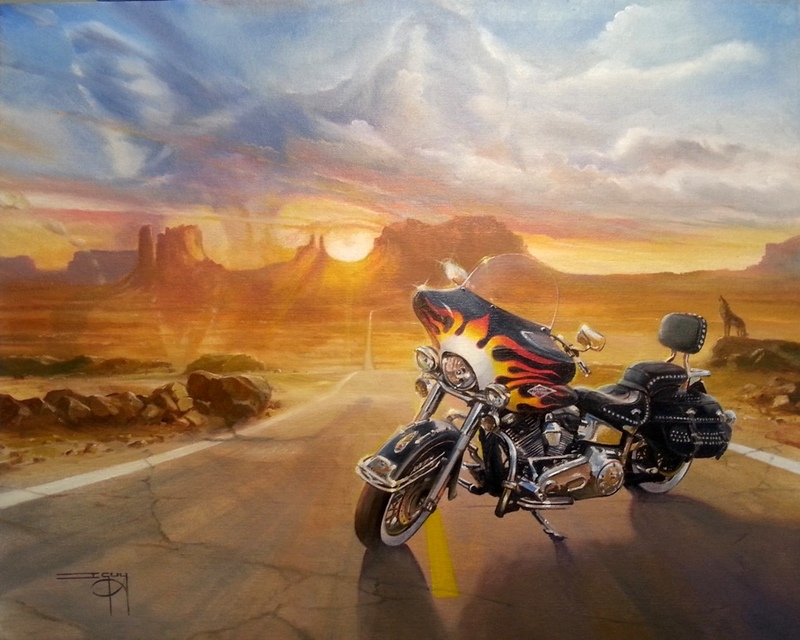 Ian has the same fascination for the Navajo regions and monument valley, if you know his work you may have seen that it is one of his favourite places to paint, over the years it has been backdrop to many fantasy road trips. He says it is his mecca, so here we were on the way to my apparent ancestral home and the answer to life for Ian ! 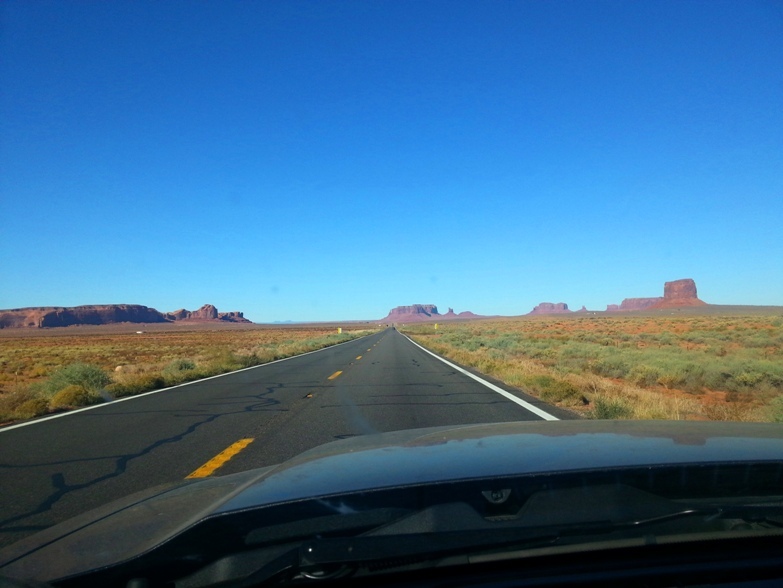 This part of our journey took on a whole different feel, even though we could appreciate the stunning scenery, we drove past many other popular tourist destinations with the exception of Lake Powell, although standing on its banks with the car park on the left of us and visitor centre on the right we quickly realised that to see this place in all of its beauty you need to be on the water and give yourself a fair few days. 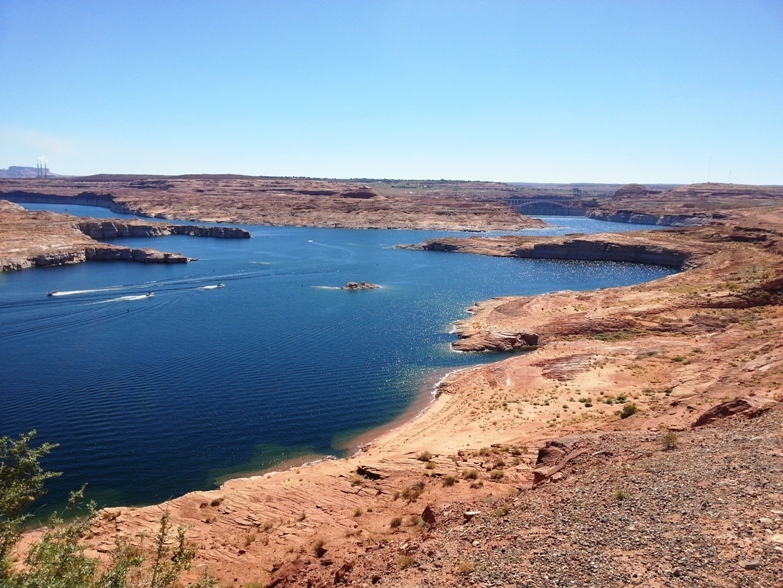 Lake Powell has 2000 miles of shoreline! We were on the 89 heading south, taking the 160 and 163 east . 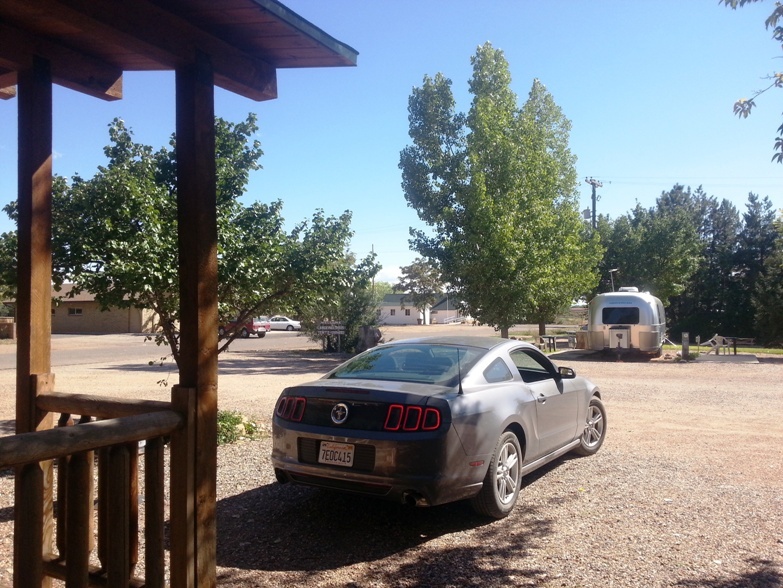 So we stopped and booked in to a privately run motel around 20 miles outside of Monument Valley. 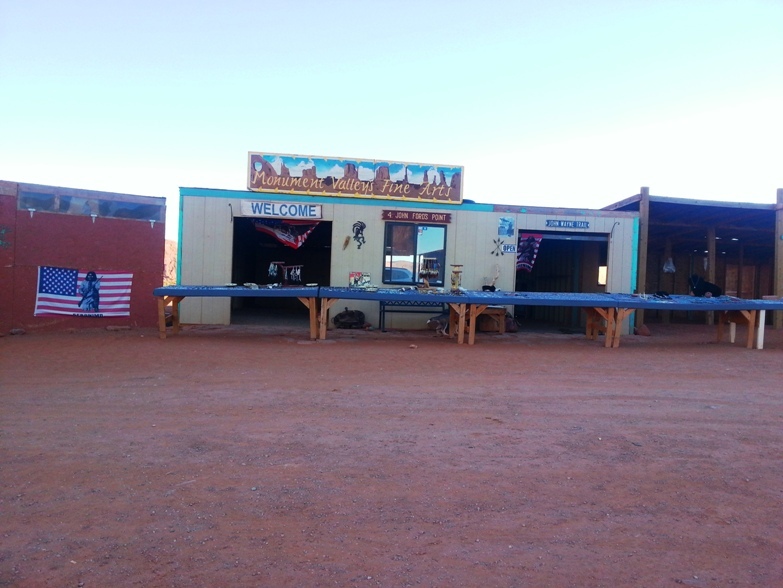 The place was Navajo run with a 24 hour cafe/restaurant serving up traditional Navajo food. 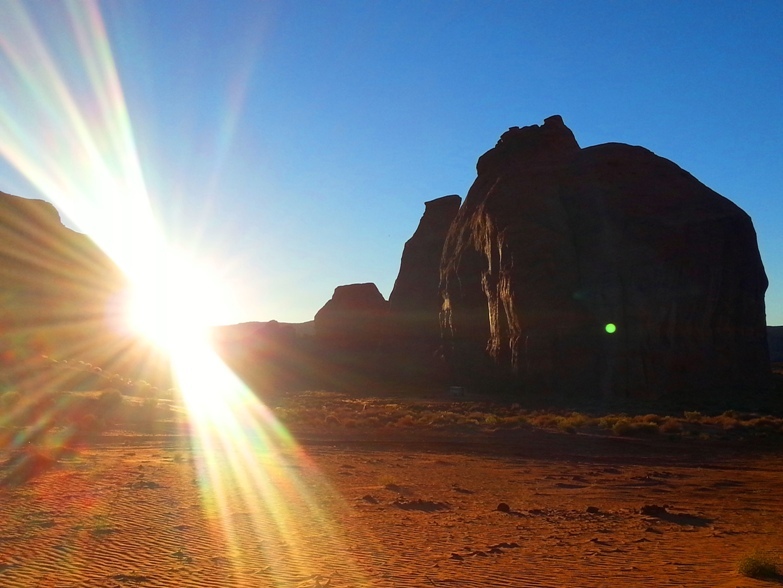 It was late afternoon and we were already getting a feel of what was to come, it was hot and the red sandstone buttes were casting shadows and throwing off a warm orange glow at the same time. 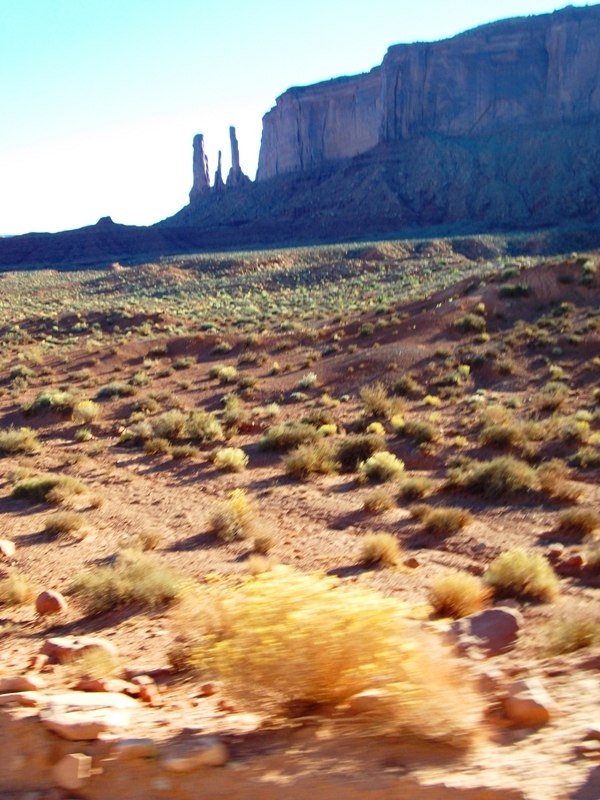 Monument Valley Navajo Tribal Park is accessed via the 163 if you are heading eastwards, there is a charge to enter the park and a 17 mile rough unpaved drive through the valley. 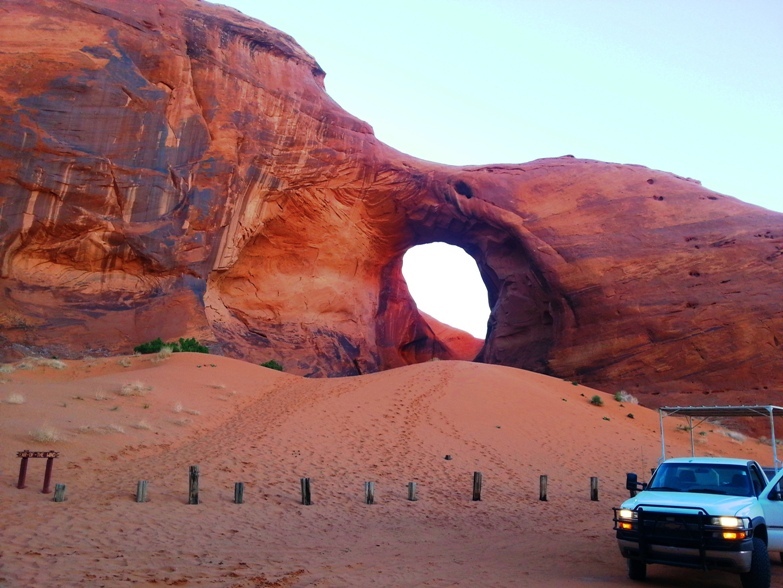 Ideally you need a 4×4 vehicle if you decide to go it alone but this way you put yourself at a disadvantage because along the trail there are restricted area’s accessible only through invitation or if you have a Navajo guide. 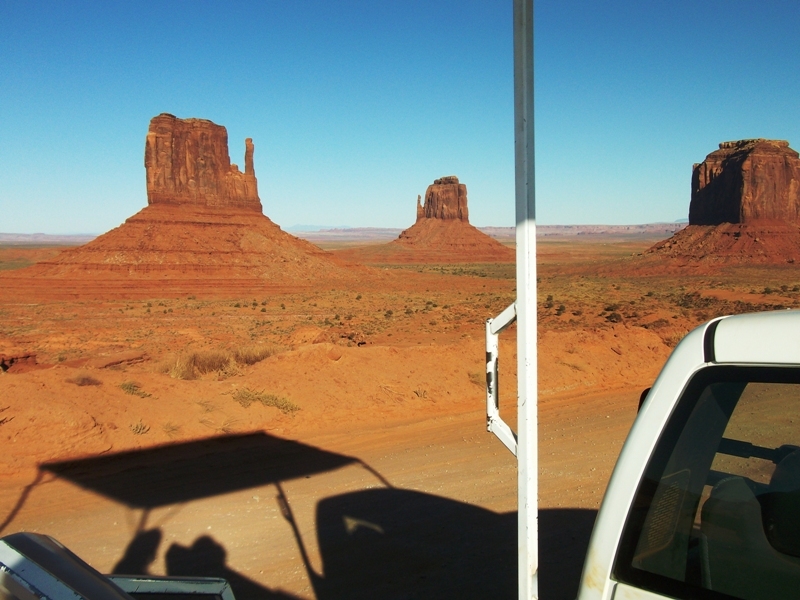 Some companies have purpose built vehicles taking out tours on a daily basis, from what I saw some have Navajo guides and some don’t. 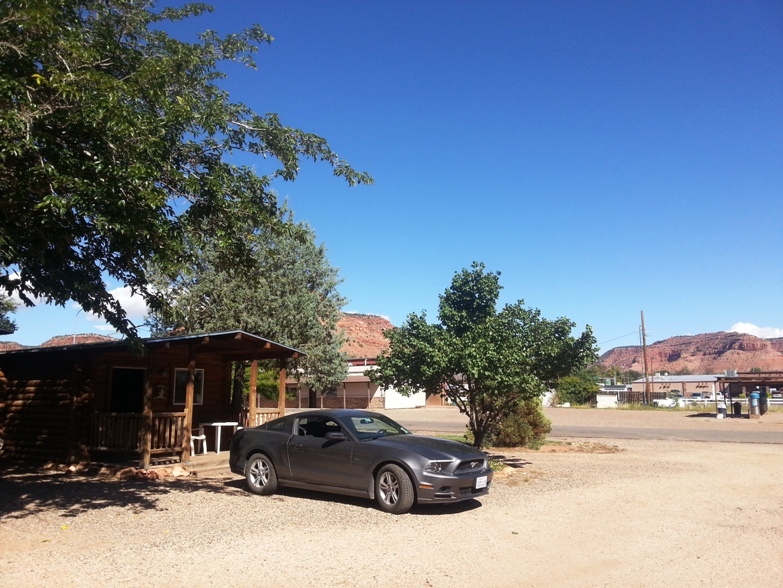 A couple of things were for certain, firstly we would need a tour vehicle, the Mustang just wouldn’t cut it and part of the insurance agreement on the hire clearly states to NOT take any hire vehicle on this particular drive, and secondly we would love a Navajo guide. 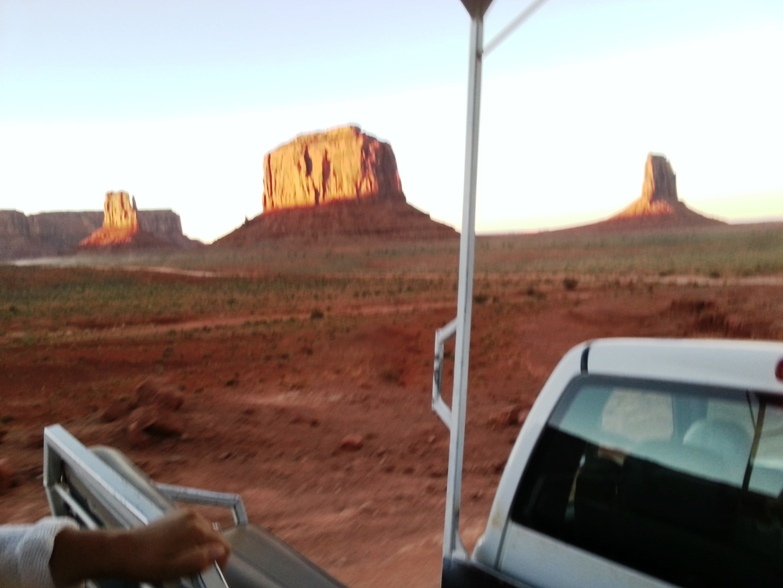 It was 4.30pm and we decided to take the 20 mile trip to the Park and see if we could take a late tour and watch the sun go down over Monument Valley. 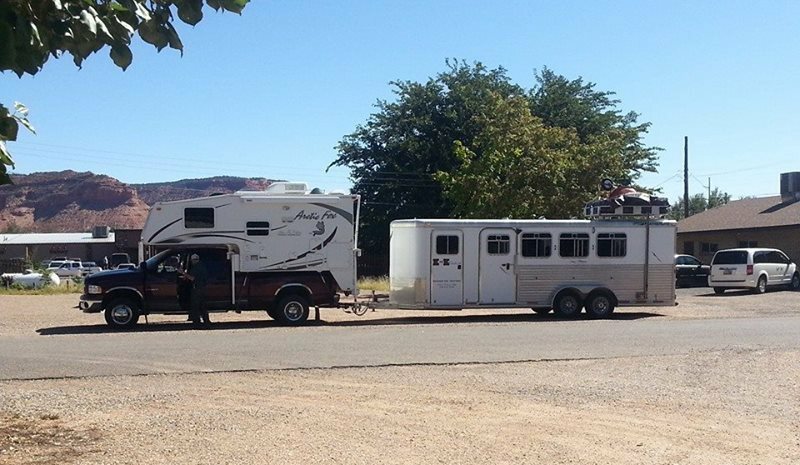 As we got nearer we saw a couple of tour vehicles heading back to the main car park away from the park. Each had about six to eight people in. The rest of the place was desolate and we weren’t feeling particularly optimistic. Some of the gift shops were closed but we saw plenty of signs offering different types of tours, the last tour of the day being the 3 hour sunset tour leaving at 4pm. It was now just gone 5. 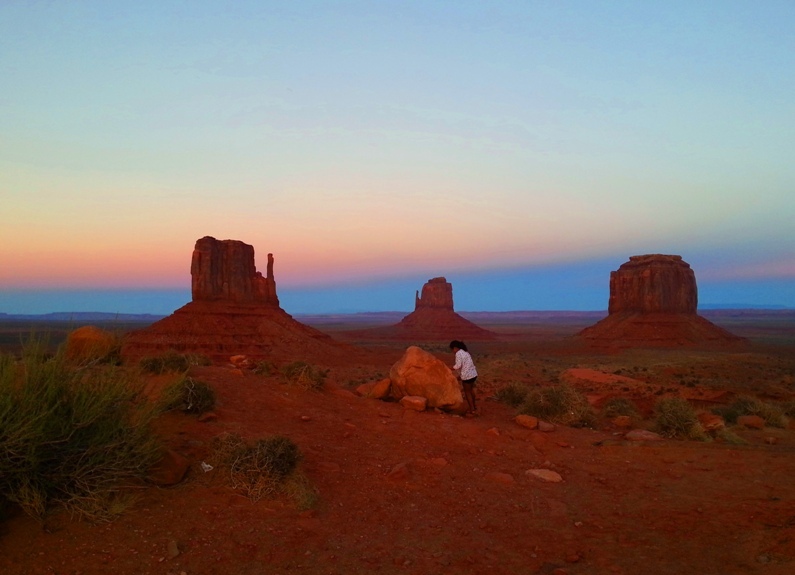 We got talking to a lovely Navajo lady about her wonderful handmade jewelry, how lucky we felt to be there, the sense of calm and the stunning orange of the light that was being cast by the sun across the sandstone buttes. I mentioned that we had hoped to take the sunset tour but we were there for three days so we had time, we said our goodbyes and turned to leave. “I can take you out, I can do really fast tour, three hours in two . We see everywhere the same, just quicker!” She had appeared from nowhere, apparently the sister of the lady we had been talking to. She introduced herself as Sandria. Over the next few hours she made us laugh hysterically and cry like babies she was perfect. We climbed onto a small bench seat in the back of her Chevy Silverado pick up , just the two of us, and foot to the floor she was off. We didn’t have time to comment on anything, the scenery, the speed of the truck, the sand in our eyes, the hot wind blowing in our faces, our mouths were clamped shut. 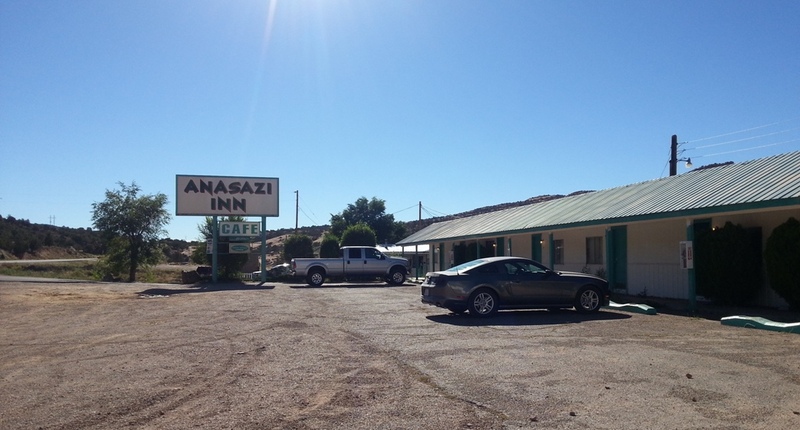 After a few miles of paved road we reached the View Hotel, Navajo owned and run, it’s the only Hotel inside the park and the entrance to the 17 mile drive. You’ve got to imagine that Sandria was inside the truck at the front and we were outside at the back, once inside the park we were overtaking people who had risked bringing in their own cars and were obviously struggling. 2 minutes later she slid the truck in sideways amongst a group of Japanese students and their German looking guide, they were learning about the history of the area, geology etc. By this time we were laughing hysterically, normally tears would have run down my cheeks but the wind and sand in my face weren’t allowing for any of that rubbish. 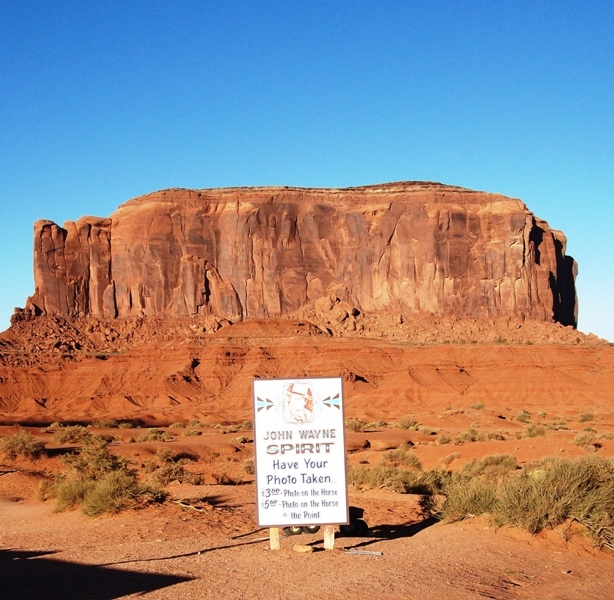 “Snoopy” She shouted pointing out of the window to one of the sandstone buttes. Then foot hard on the brake she stopped the pick up and got out for the first time. “It’s mostly what I listen to” although I wasn’t ready right then to admit I had never really been a fan of Bon Jovi. After going through a list of Rock Bands that I loved and the ones we had seen live I felt at that point like we had passed some kind of initiation. 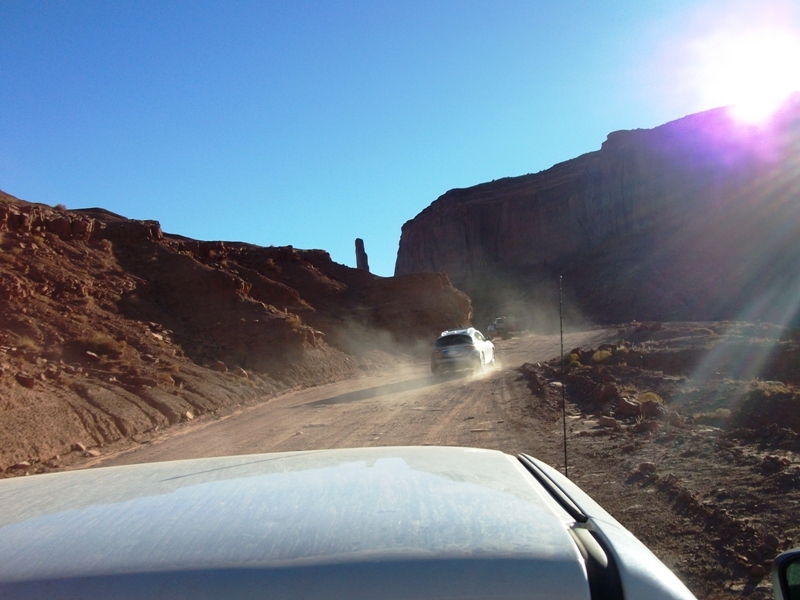 We turned up late and had expected everything and we were getting it all rough Navajo style. Fry bread as I understand it is a bread dough, left to rise then shaped into pizza size rounds and fried. It’s specifically a Navajo Indian thing. 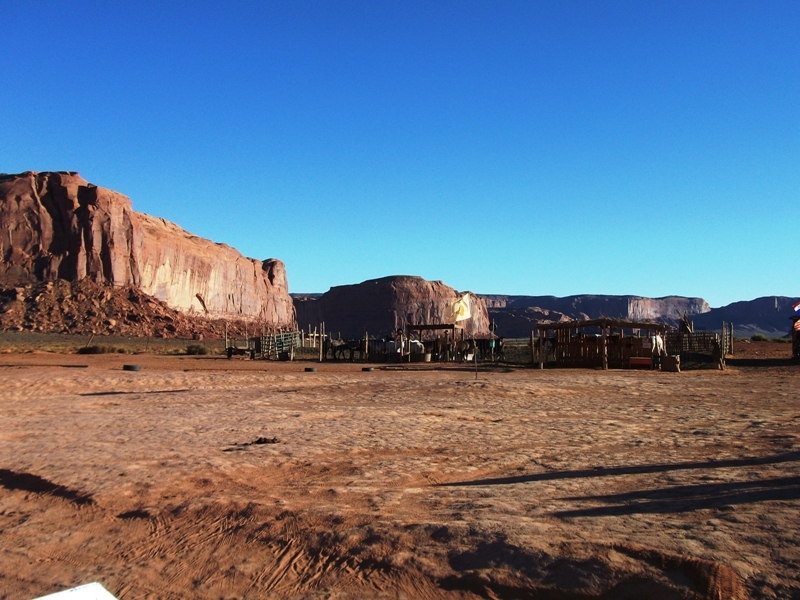 We did go to John Ford point, at a slower pace, Sandria ate fry bread , Ian looked at gifts and for the first time this is where I felt Monument Valley, sort of calm and knowing. Although this is quite a commercialized area for inside the park, at that point in the tour I weirdly felt at one with it. 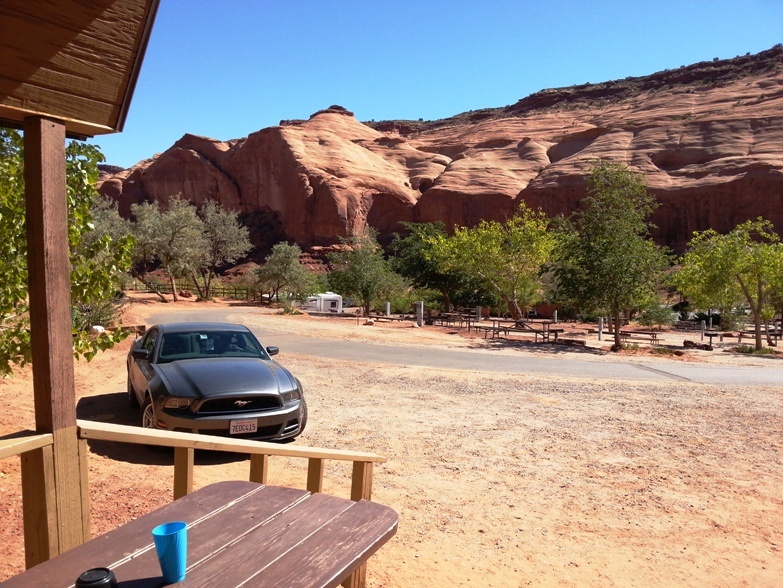 We disappeared up a very narrow restricted road around the side of a sandstone mesa and back down again into a Hogan village. 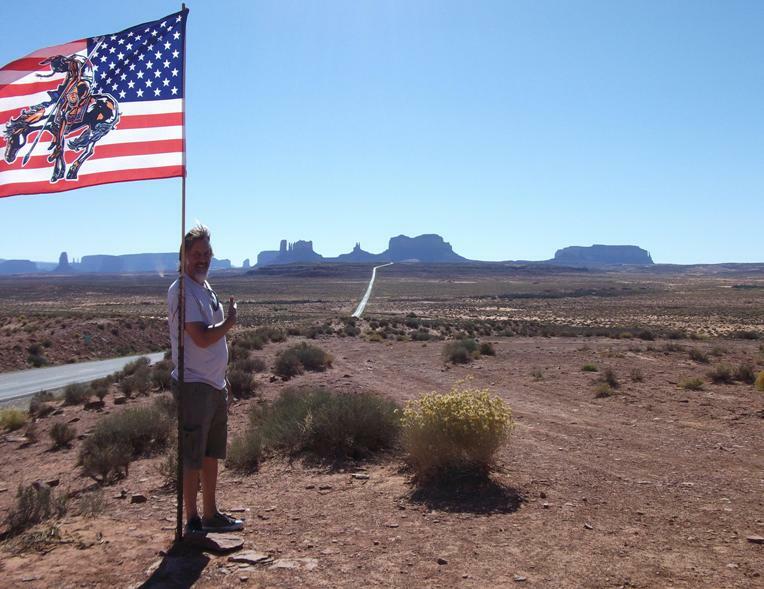 I was so excited at that point to have my Navajo guide and to be in a restricted area although we got the impression that if we hadn’t admitted to loving AC/DC , amongst others, we would be somewhere completely different. What went on next has to remain confidential. I will only tell you if you bring me specialty cheese and admit to liking thrash metal. I’m not sure whether our next stop was in a restricted or unrestricted area. 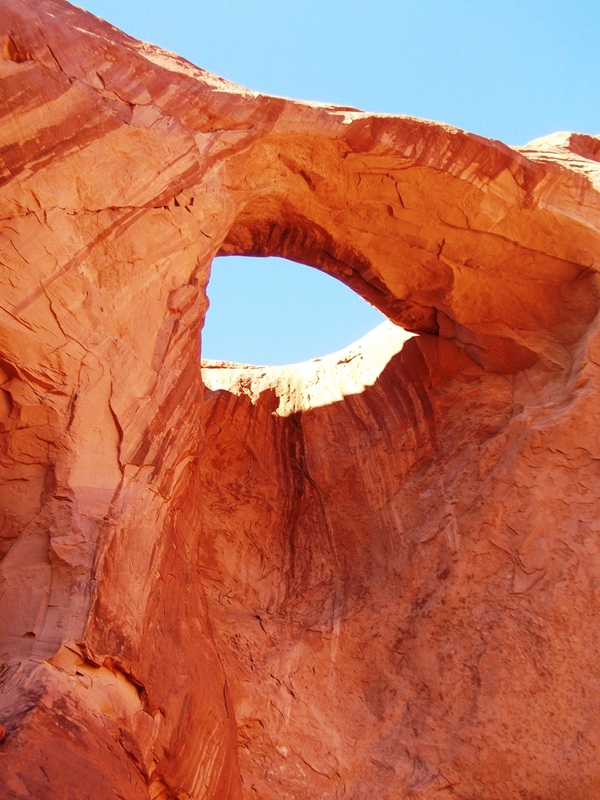 It was a cave type natural sandstone arch “Eye Of The Sun”. The eye, a hole in the top of the archway, was where we were told to look. Sandria found us a place to lie comfortably on our backs, she told us to relax and just to take in and feel what was around us. She stepped a few paces back and told us that because there was just the three of us alone she would sing. 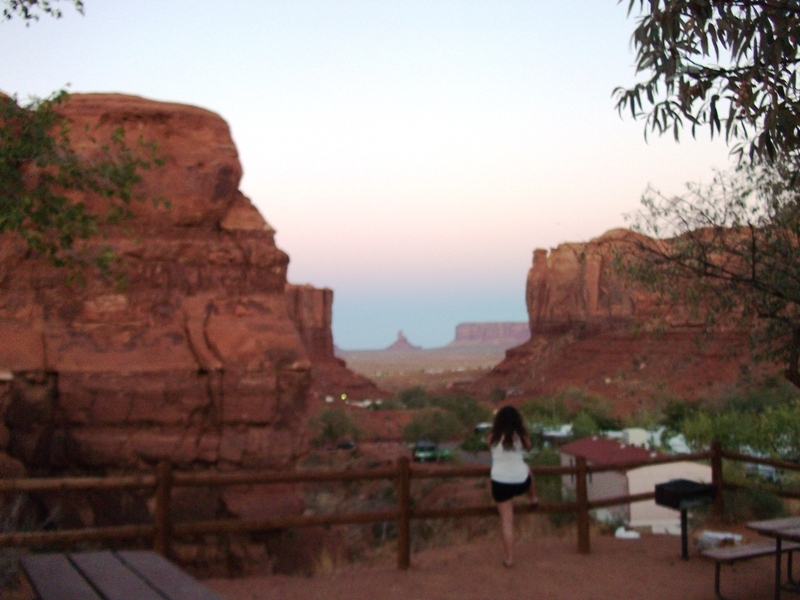 She sang to us the most beautiful Navajo song. Of course I had no idea what she was singing, but her voice was wonderfully hypnotic, enchanting. She stopped and as if in a state of temporary paralysis we lay there, it was so quiet. I looked at Ian and tears were pouring down his face as were mine. She explained it was a welcome song. Still sitting she told us to look around. 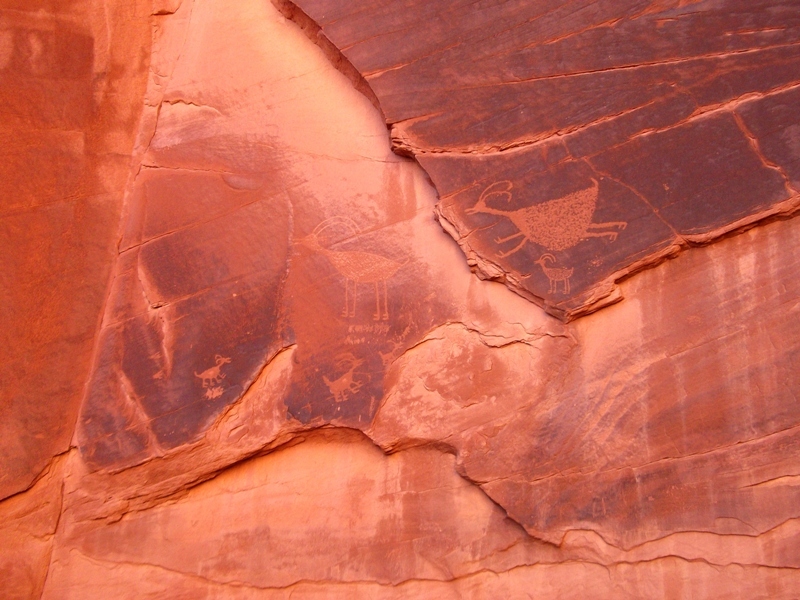 The walls were covered in ancient animal drawings. Wow ! We had already gone past our two hour deadline, but were quietly taken to a place with no introduction. “You’ll see the best sunset from here” She explained. It was just us so quiet and stunningly beautiful. We wandered back at a slower pace, slowly losing sunlight and passing the occasional marooned tourist in their town car balanced on a boulder or half in half out of a ditch. I wondered what was the protocol. 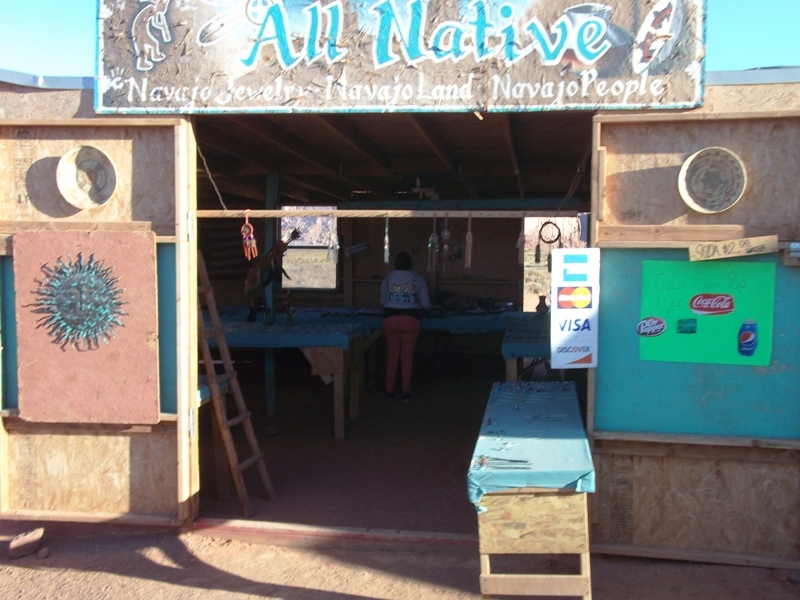 Lock them in at closing, with a sign for the car written in Navajo saying “Serve you right for not listening” or maybe they tow them out at a cost still using the same sign. We said our goodbyes to Sandria and later jointly counted our blessing for having a guide that suited us, our personalities, our impatience, our not being too fond of standing around listening to tour guides going through the motions. 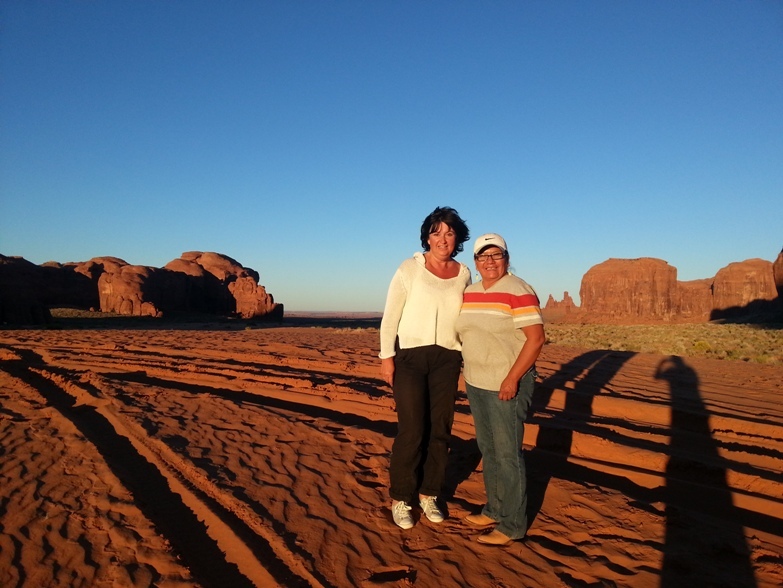 We didn’t learn history, geology or very much in the way of Navajo traditions from Sandria but we got to spend an afternoon with her in her life, amongst her family and in her place. We felt honoured. We had to do it, we drove the Mustang back to the park and parked up to watch the very last of the sunlight disappear. 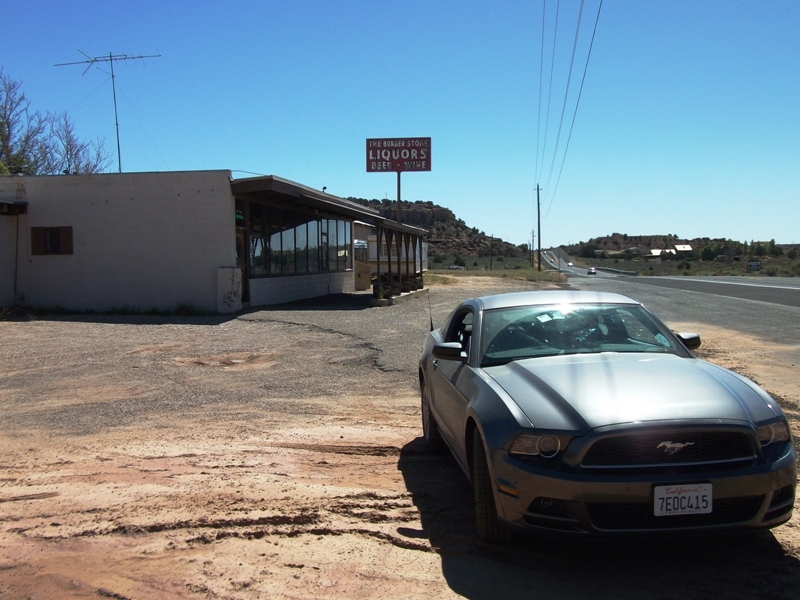 Heading back to the motel and knowing there was a 24 hour cafe was a good feeling. It must have been around 10.30pm when we eventually ate. 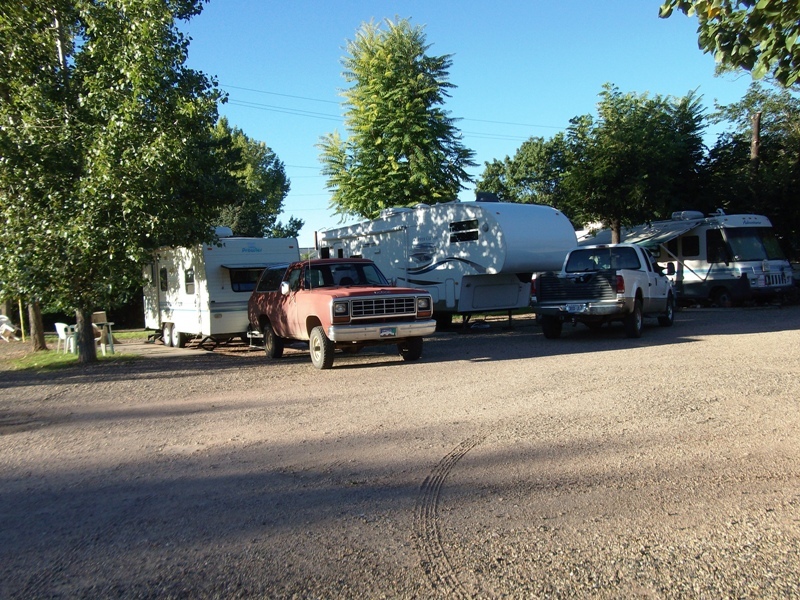 The place was empty with the exception of two truck drivers, just passing through I guessed. I ordered a beautiful liver and onions with mash and Ian had Navajo burger. 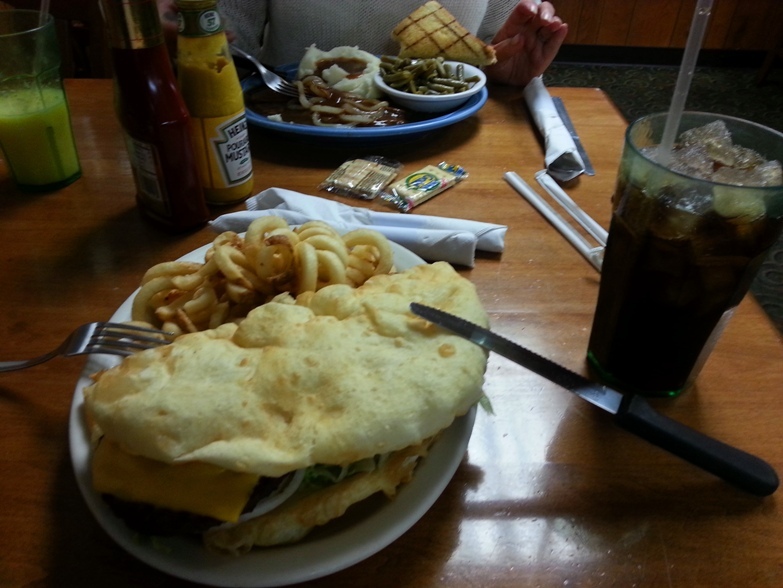 Huge fry bread with burger and all the trimmings. The girl who served Ian smiled in a kind of ‘I dare you to eat it all’ way. He did eat it all of course. Excited to get to our cabin just a few miles outside the park we left early the next morning. 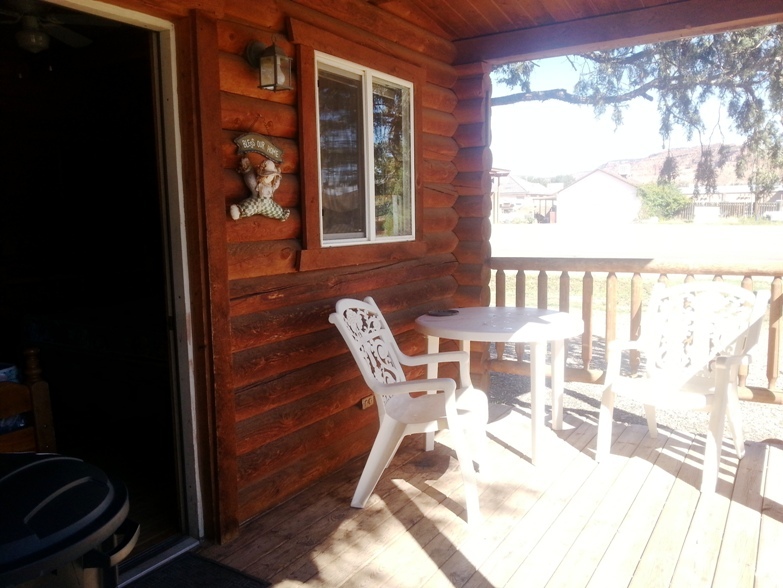 It was awesome, six cabins I think in total a good amount of space between each with a picnic table and bbq. 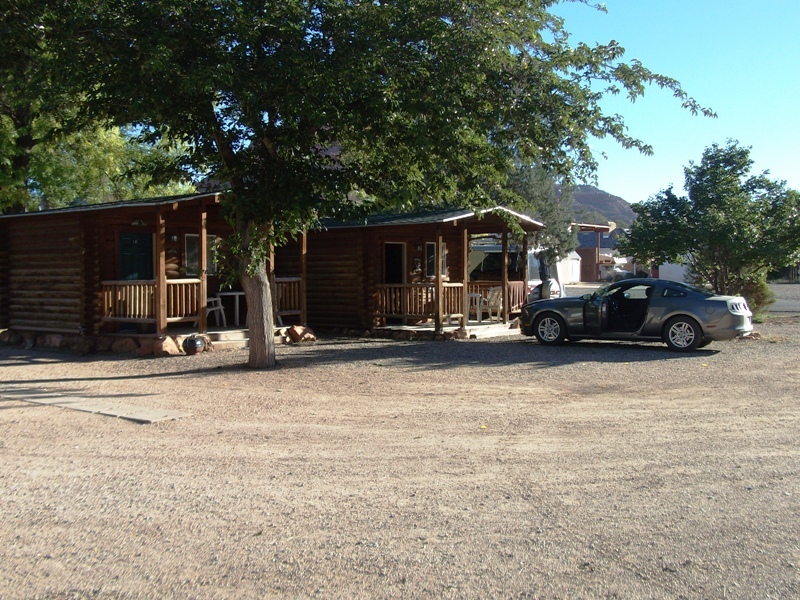 Inside was similar to the cabin in Kanab but with the luxury of a small bathroom and kitchen. 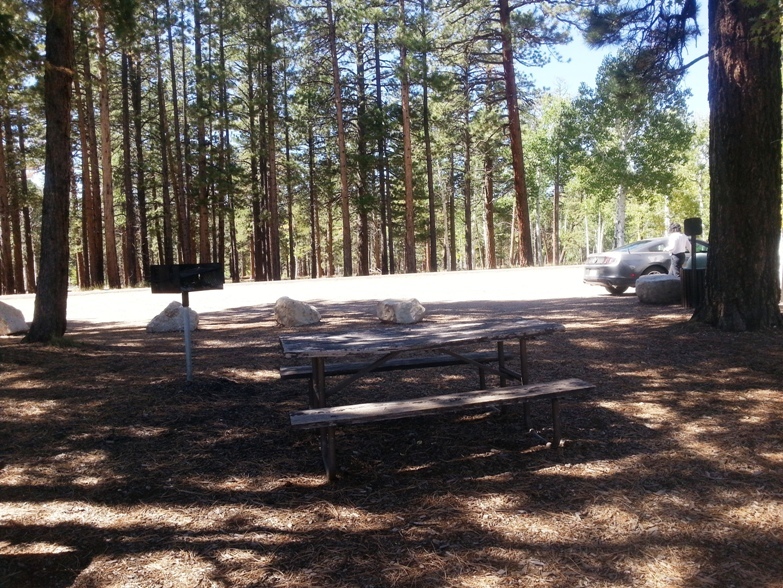 Being an RV park and camp site I wasn’t sure what to expect, but we couldn’t have wished for better. 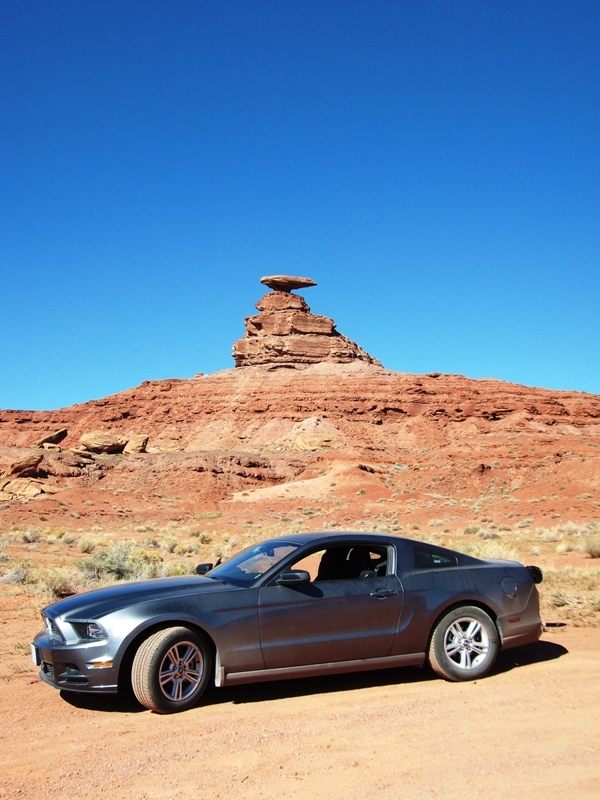 Firstly we were surrounded by sandstone buttes, right there on our doorstep, we were amongst them. They were red, the sand was red as were you by the end of each day. Our cabin was the highest so the view was phenomenal nothing was on flat ground and the RV’s and tents were tucked into their own private areas. That day had to be one of the hottest we had experienced since we had arrived in the US, with the exception of the lowest points in Death Valley. We bought supplies from the local shops, got back stripped off to the bare minimum and sat on our little Verandah just looking until eventually the sun went down on one more day. 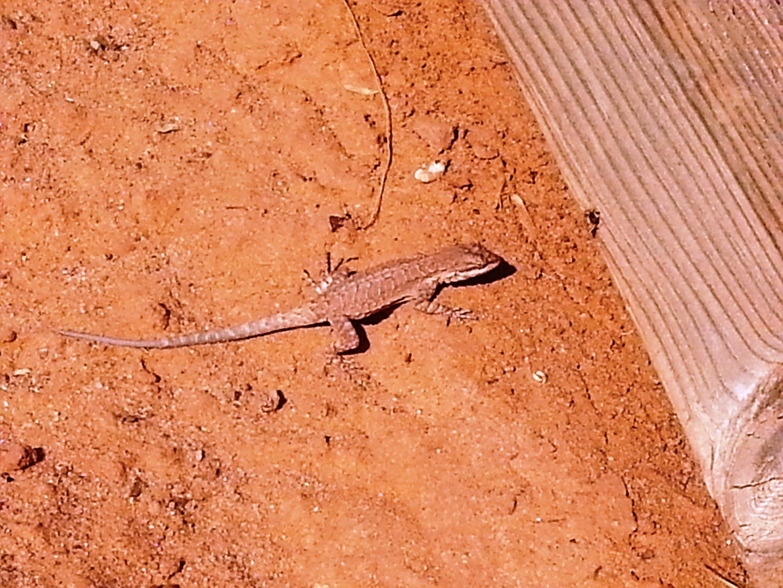 The sand and sun combined had sent us different shades of red. 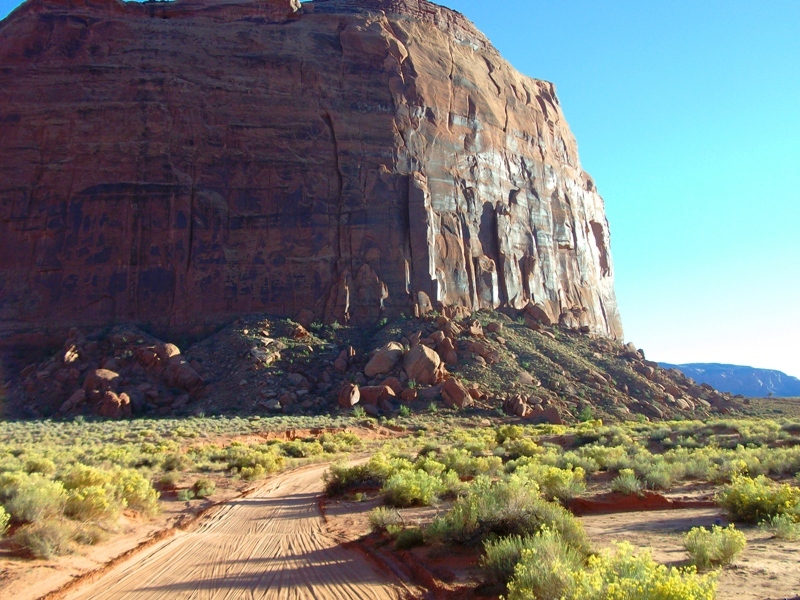 Monument Valley is in the four corners region. 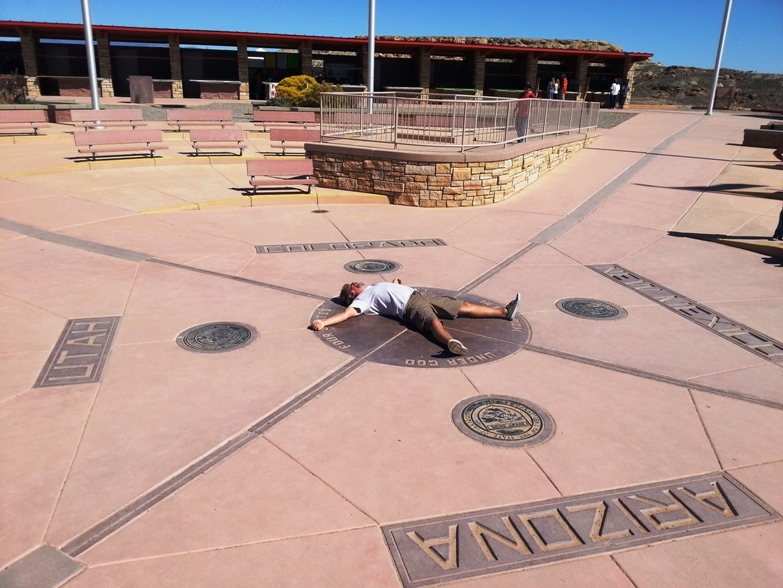 The four corners monument marks the point in the Southwestern USA where the states of Arizona, Colorado, New Mexico and Utah meet. So during our stay of course it was necessary to visit that point and stick a leg and an arm into each state at the same time and get a photo. It was very commercialized but well thought out, with a kind of sweet sophistication. We visited the Mexican Hat as did everyone else, but the heat was getting so we couldn’t move around too much in the day, unless we were in the car with the air conditioning on and that suited me just fine. Taking drives into Colorado we were surprised how it was almost instantly greener and meandering. 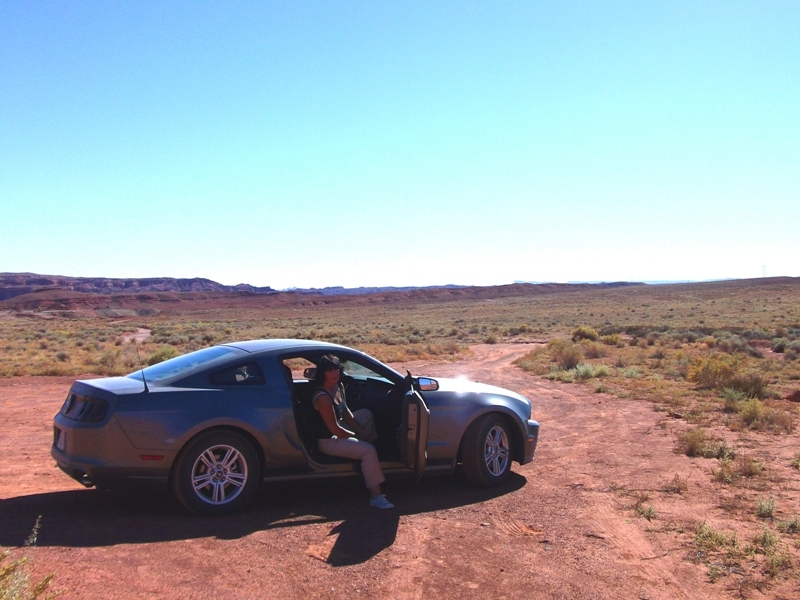 We were heading into New Mexico after Monument Valley so decided to leave any traveling that way until then. 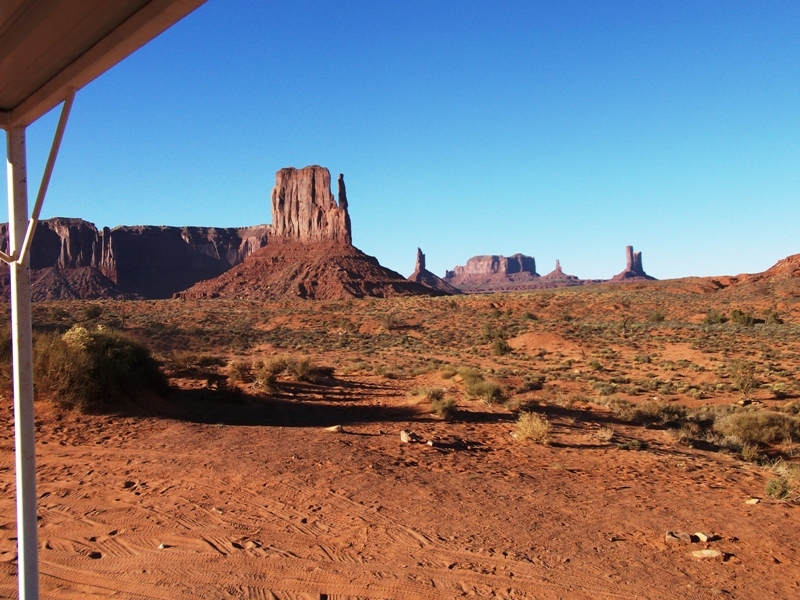 Most of the day we watched the view of the Buttes from our cabin, in HD, 3D, and as if we were on LSD they changed with the light from the proud heads of Native Indians to John Cleese, Oliver Hardy and Kermit the Frog. There were signs asking you not to feed the dogs but it was obvious that people rarely took notice, Betty looked a healthy weight and was exceptionally clever she played a good game and I was more than willing to play the part of feeder, she was unassuming always allowing us to eat first and waiting to be called for leftovers. That was Betty that was the way she was until we left, unassuming, calm, gentle, elegant and exceptionally clever. 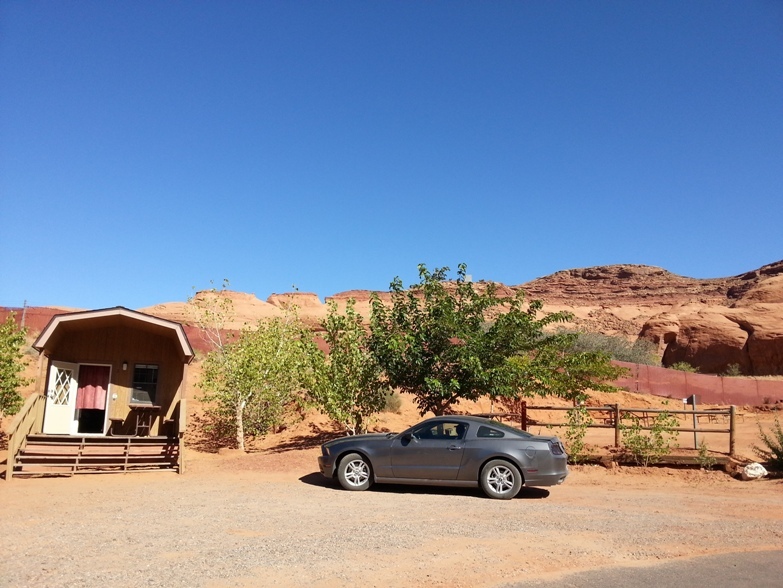 The ranger would pay impromptu visits to the park, she could hear his car a good minute before it arrived and go and hide behind the cabin. 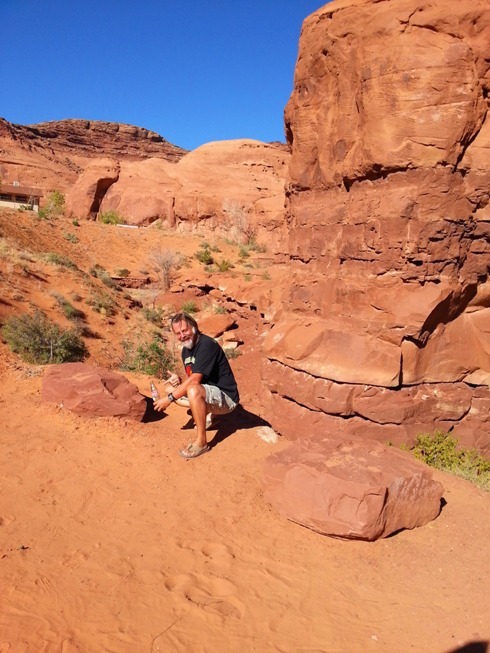 It was really hard leaving Monument Valley, and Betty the dog, but I am confident in thinking that like the Charming guy who seduces Shirley Valentine , Betty just washes herself down and moves onto the next person and the next left over steak. If you don’t want to miss the next part of the journey please subscribe for updates. You’ll find the box for your email address up on the left hand column. Enjoyed reading about your journey Mandy. I was especially glad to learn of you and Dorians urge to jump, I have had the same urge for decades always thinking myself a bit weird as I have never known anyone who felt the same with heights, until now. I got a present of four jigsaws (one box) with four scenes of classic British cars, Morris MInor, Mini Cooper, Jaguar and MGs….brilliant is how I would decribe them, the settings Ian has put the cars in equally so. Enjoy the rest of your holiday.